The Chief-of-Staff of the Strategic Air Command in the 1950s, he died at Heritage Park Skilled Care Center in Bradenton, Florida of complications following neurosurgery on August 27, 1987. He was 75-years-old and had served as executive director of Freedoms Foundation of Valley Forge, Pennsylvania, for a year after his retirement from the Air Force in 1966. He continued to serve on the foundation's board until his death. Born at Hollidaysburg, Pennsylvania, on December 15, 1911, he graduted from West Point in 1933. He served at SAC under General Curtis LeMay from 1952 to 1956. From 1962 until his retirmenet, he was Vice Commander-in-Chief of the United States Air Force in Europe. He is buried in Section 30 of Arlington National Cemetery. 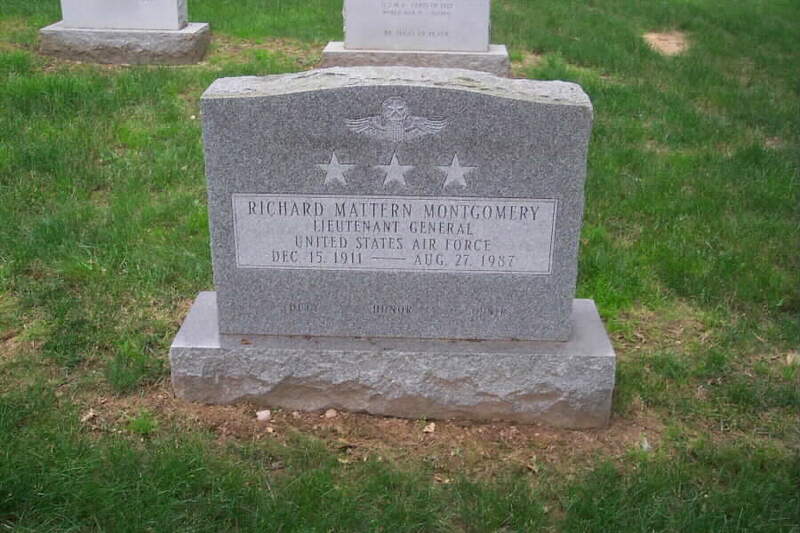 Lieutenant General Richard M. Montgomery was born in 1911 at Hollidaysburg, Pennsylvania. He attended the U.S. Military Academy at West Point graduating with a lieutenant's commission in 1933. 0ne year later he completed pilot training at Kelly Field, Texas. This was the beginning of an active flying career in which the general has logged more than 10,000 hours in more than 80 types of aircraft including the KC-135 jet tanker (military counterpart of the Boeing 707), B-47 and B-52 intercontinental jet bombers. The assignment which did most to shape his subsequent career was that of chief of staff, Headquarters, Strategic Air Command, Offutt Air Force Base, Neb., in September 1952, a post he held until September 1956. As a principal staff assistant to then SAC commander in chief General Curtis E. LeMay, General Montgomery participated in the buildup of SAC into the most powerful military force in the world history. In 1956 he was assigned as deputy commander of the 2d Air Force (SAC). then vice chief of staff. For the next year he continued in the same job when General Frederic H. Smith became vice chief of staff. Air Force headquarters in the Pentagon where his extensive field experience was brought to bear on the entire Air Force wartime training program. A 1947 graduate of the Air War College, General Montgomery became a member of the Joint Strategic Plans and Operations Group for General Douglas MacArthur in Tokyo. The following year he joined the 51st Fighter Wing at Naha Air Force Base, Okinawa. Flying then the new F-80 jet "Shooting Star" aircraft, the 51st Jet Fighter Wing pioneered in long overwater mass jet training flights in the Far East under General Montgomery's leadership. Returning to the U.S. in 1949 he was assigned to Biggs Air Force Base in Texas and early in 1950 became deputy commander of the 97th Bombardment Wing located there. His assignment to SAC headquarters followed that tour of duty. A veteran of more than 30 years Air Force service, General Montgomery was twice awarded the Legion of Merit while serving with the Strategic Air Command. In August 1959 he was named assistant vice chief of staff, Headquarters U.S. Air Force. At the end of his Pentagon tour he was presented with the Distinguished Service Medal by General LeMay, U.S, Air Force chief of staff. He was assigned as vice commander in chief, U.S. Air Forces in Europe, at Wiesbaden, Germany, Sept. l, 1962 with promotion to the grade of lieutenant general.